We started this week with the celebrations of Christmas. As you know we have five centres around the four villages. 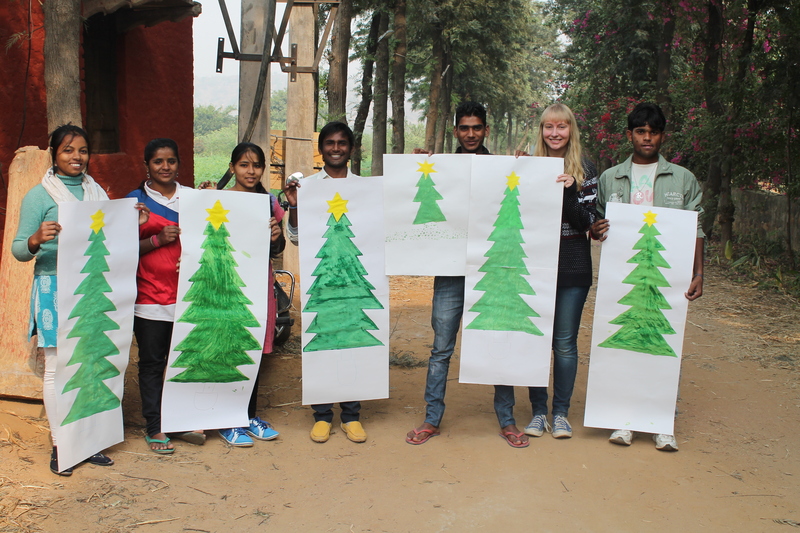 On Monday, 22nd of December we celebrated Christmas at two centres: Alampur Village and Dhauj Village. We put the Christmas tree and Santa Claus posters on the wall and asked the students to draw something on the Christmas tree. All of the students were so excited to celebrate Christmas and they all drew and wrote their name on the poster. We explained about Christmas and why we celebrate this festival. Then we sang a Christmas song with the pupils while the teachers arranged a little refreshment for the students. They all looked very happy because they celebrated this festival for the first time in the village. Hence, they got an opportunity to know about a different culture. On Tuesday, 23rd of December we celebrated with the other centres and found it very interesting. Today we played ‘Secret Santa’ with the teachers. We made slips with the teacher’s names on and then asked them to pick up a slip one by one. 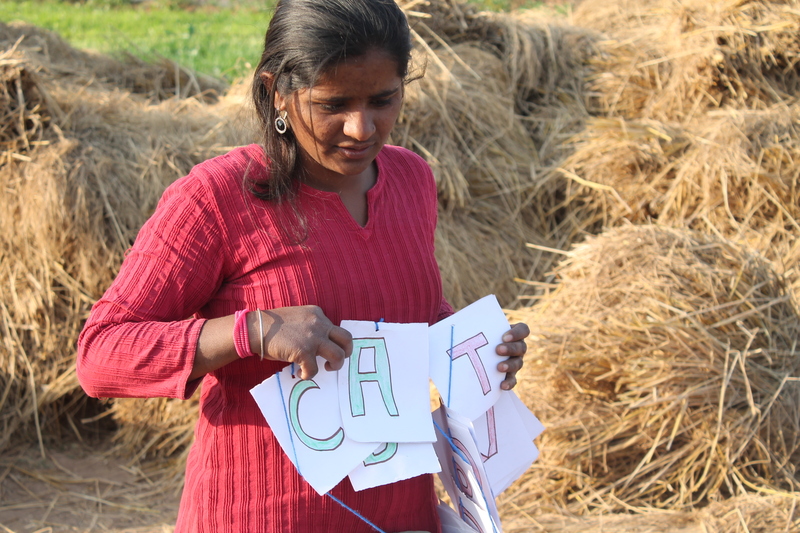 We asked them to make a greeting card for the person whose name was on the slip, and they all did very well. It was a new thing for the teachers to become more creative. 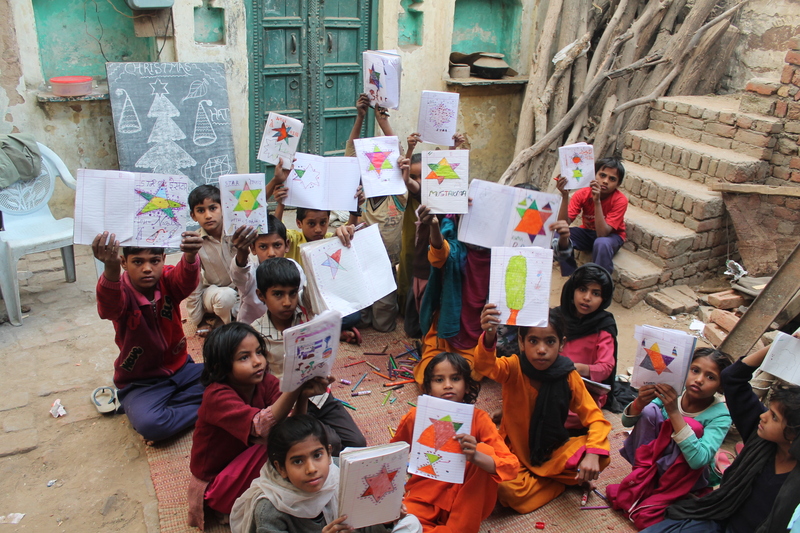 As we mentioned above, the students participated for the first time in Christmas celebrations, because in rural areas nobody celebrates this festival. 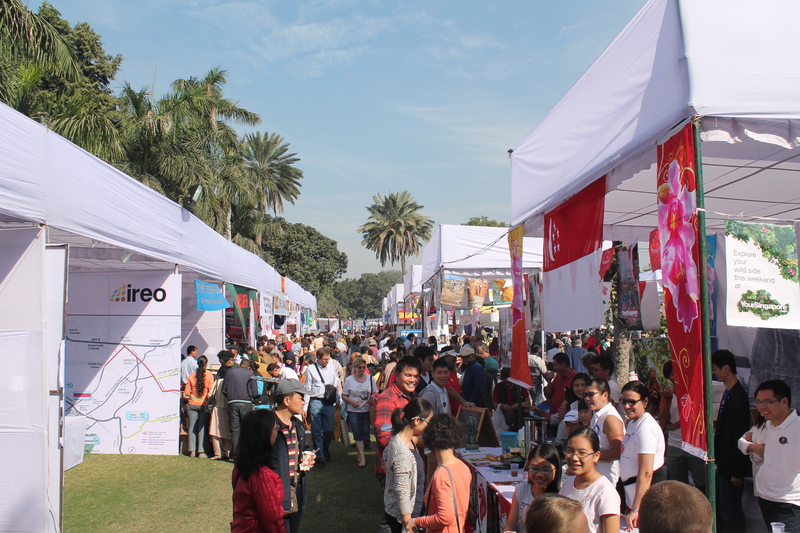 So, we are creating more awareness among the students and community that we have to participate in all religious festivals. According to the Indian constitution India is a secular country that respects all religious festivals. On Christmas Eve we decorated a fig tree in the park of the Laksh Farm. We put lots of decorative things on the tree. We put a big star on the top of the tree and put lots of stars, bells, and tinsel. It was fun and the tree looks beautiful. This week we decided to make our morning class more effective and creative, to develop the skills and increase the knowledge of our teachers. As you know we have English sessions with the teachers and we found that we have to make worksheets to make them perfect. So, we used many ways e.g. cross words, word searches, choose the correct word, fill in the blanks, draw the pictures and sentence writing. Everything we have done by using worksheets. The topics we covered are prepositions, opposites, and plural words. The teachers’ performance was impressive. Hence, we are trying to improve their skills. In regards to creativity, we decided to experiment with mixing paint colours. It was a good way to learn the basics about painting. 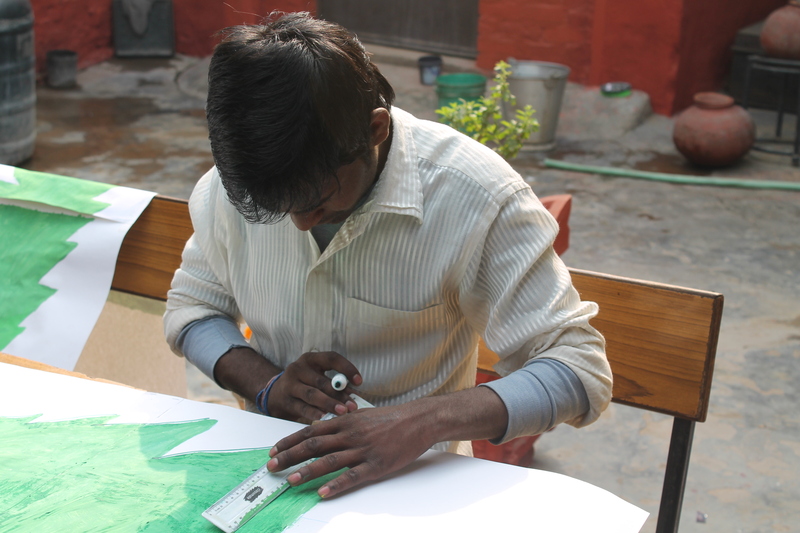 We want to develop their skills in various ways because painting is a good way to focus the mind and concentrate on their studies. We took paints to each centre and we experimented with the students. They enjoyed it and learnt a lot. 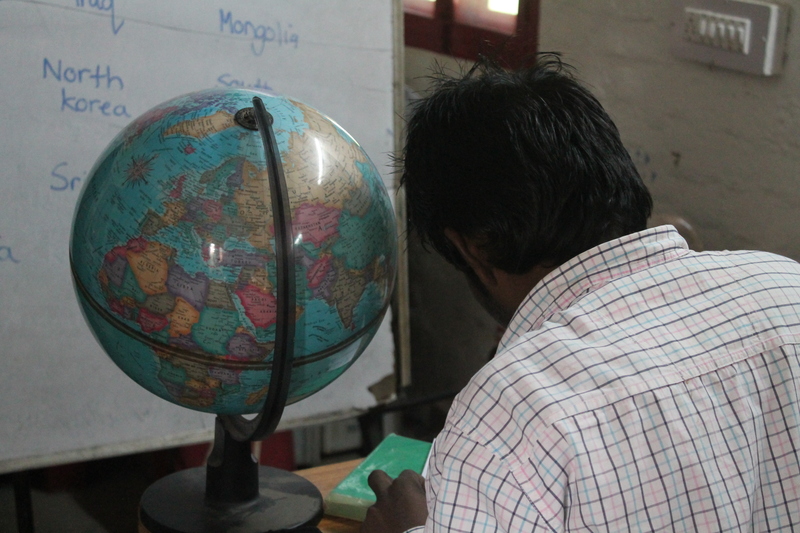 Our teachers are eager to learn more about the world so we decided to teach them geography. We are focusing on each continent in detail, and the teachers are looking at the globe and world map to find the countries. To make our lessons more interesting we introduced some new whistle games. 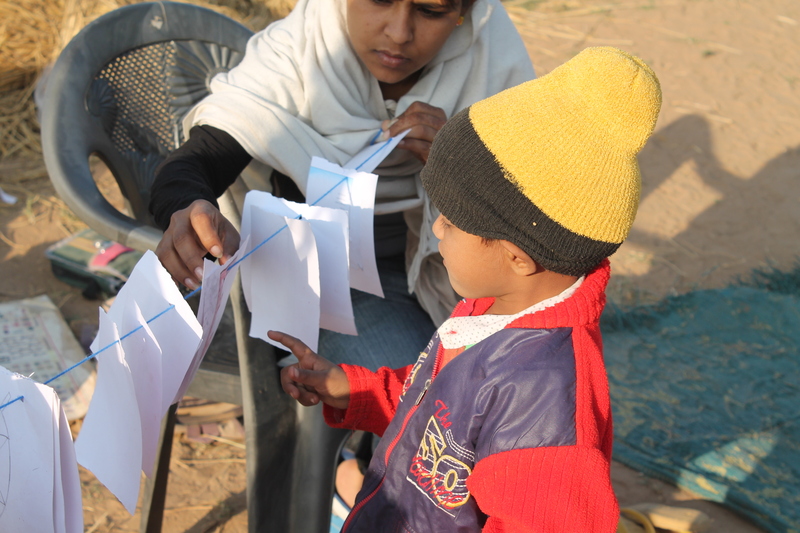 First we did story writing with the whistle, where the children pass the story around the class when the whistle is blown. It was a successful game for their learning. Also, by passing a ball around the class and choosing a student by blowing the whistle and asking a question about a given topic, we can make sure each child is participating in the class. We’ve used this in all of our centres, and we’re really pleased with the reaction of the children. 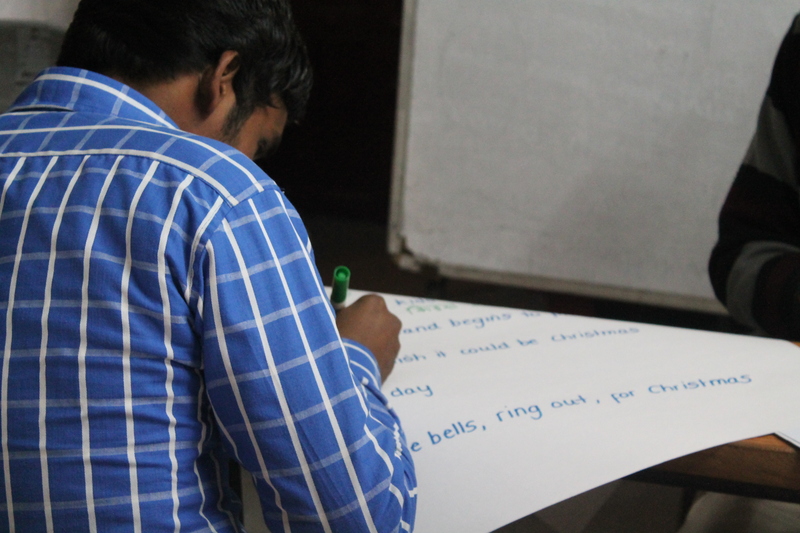 In the second week of December we thought about innovative ideas for teaching. 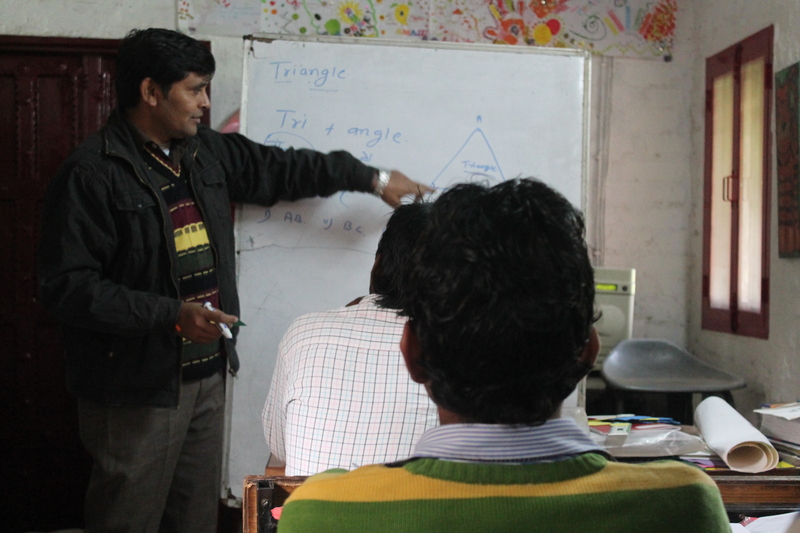 We’re trying to make our teaching more effective and creative, so that we can encourage the pupils to study. 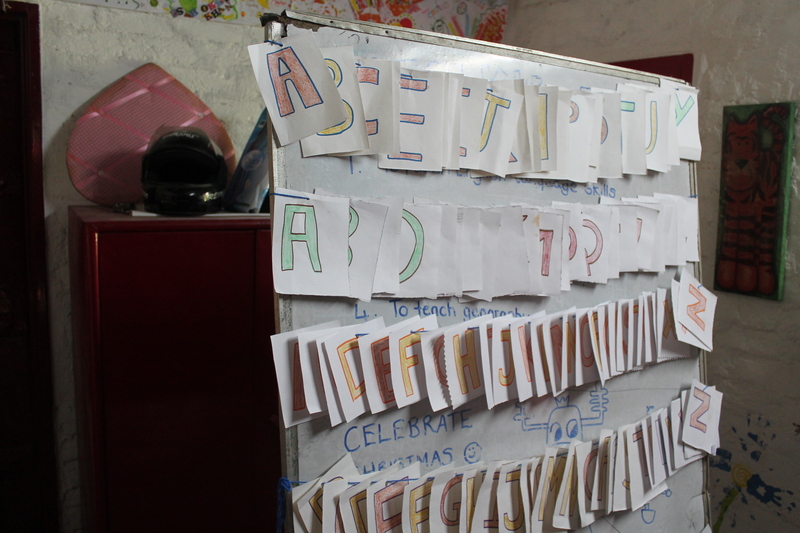 We made some worksheets for the teachers, and we made some English alphabet and counting 0 to 9 flash cards for creative teaching, and to encourage their participation level through different ways. 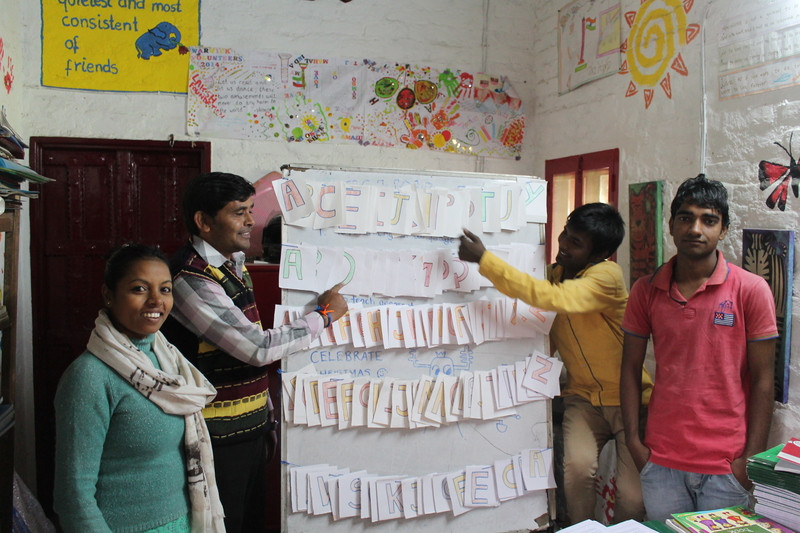 We also did cross words and word search activities on prepositions with the teachers, so that we can get ideas to make more worksheets for the students in our centres. 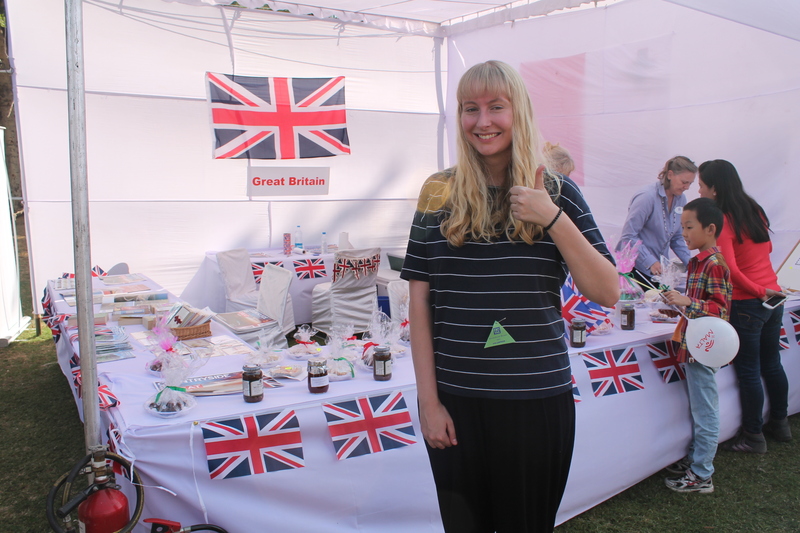 To increase the knowledge and skills of the teachers Rebecca taught some Geography lessons on continents of the world. We looked on the map and marked all the continents and learnt the biggest country in each. Rebecca made some worksheets on the same topic to know how much they have learnt. Rebecca has been teaching us music along with our everyday lesson planning, for our Christmas celebration. The song is called ‘I wish it could be Christmas everyday’. 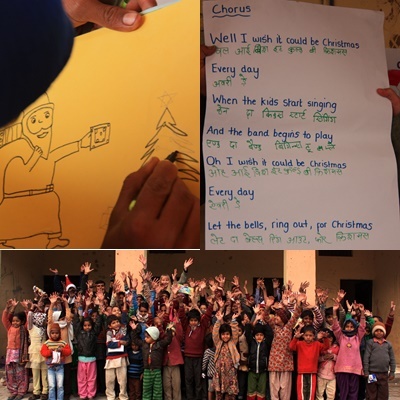 We are reciting this song every day for Christmas celebration and we are going to celebrate Christmas in our all centres. 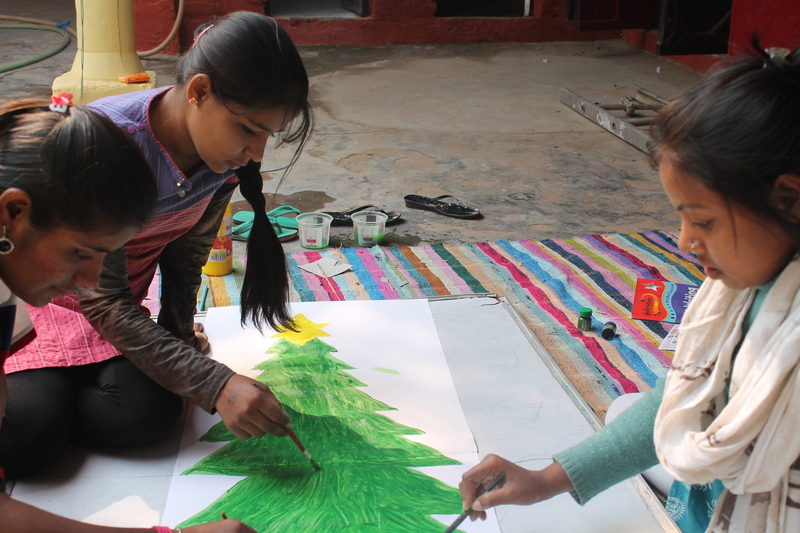 We also drew Christmas trees for the celebration, which the children will decorate on the 22nd and 23rd December. 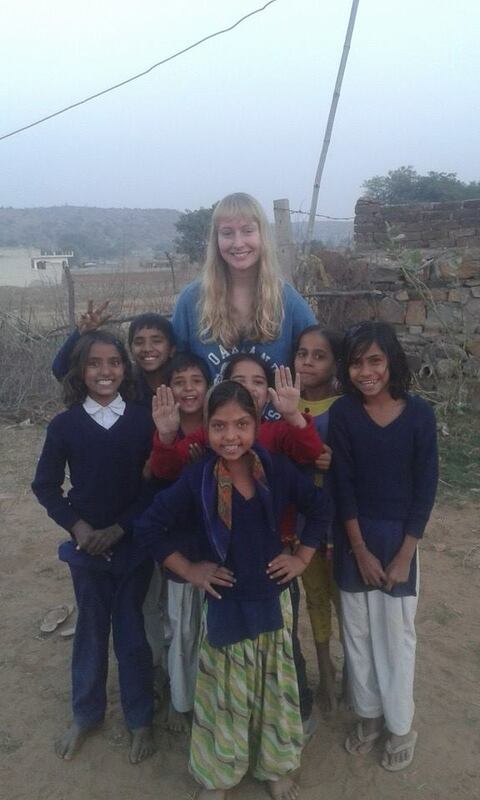 On Friday, 5th of December 2014, we were reunited with Rebecca Fletcher, one of the Warwick university volunteers which we had this summer. 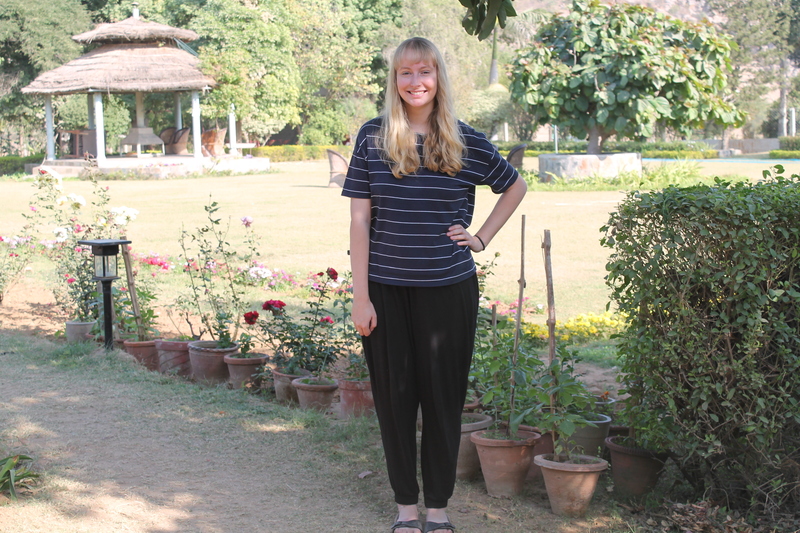 She has returned to India to support the project. 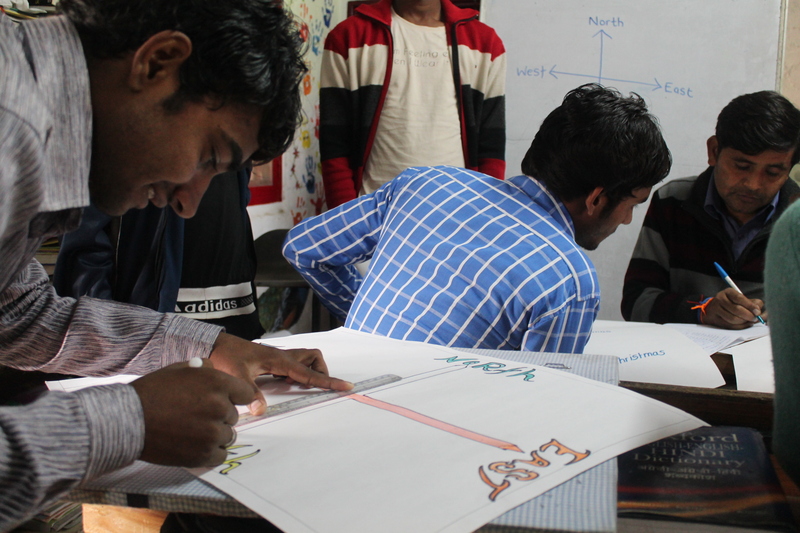 The Laksh Foundation is very grateful to the University for sending such great volunteers to help the Foundation. 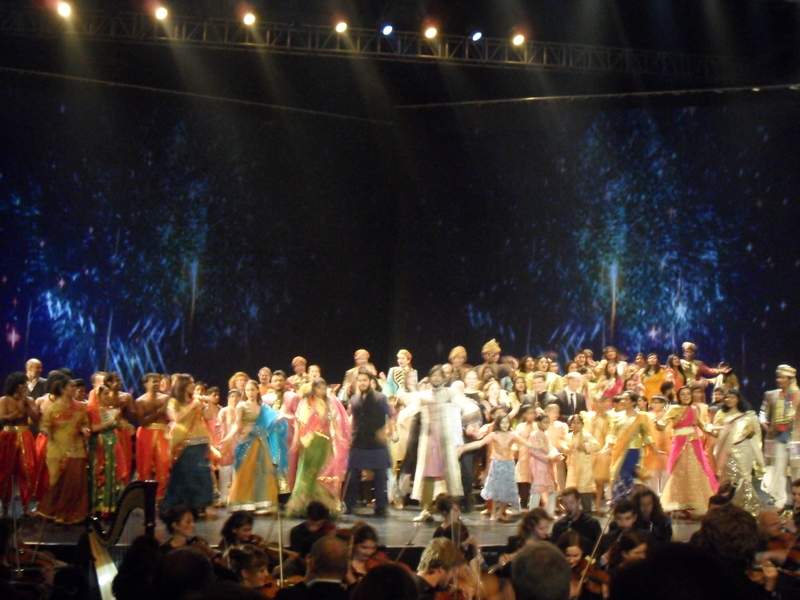 On Saturday, 6th of December 2014, we went to see ‘OPERA GALA’ at Jawaharlal Nehru stadium in Delhi. 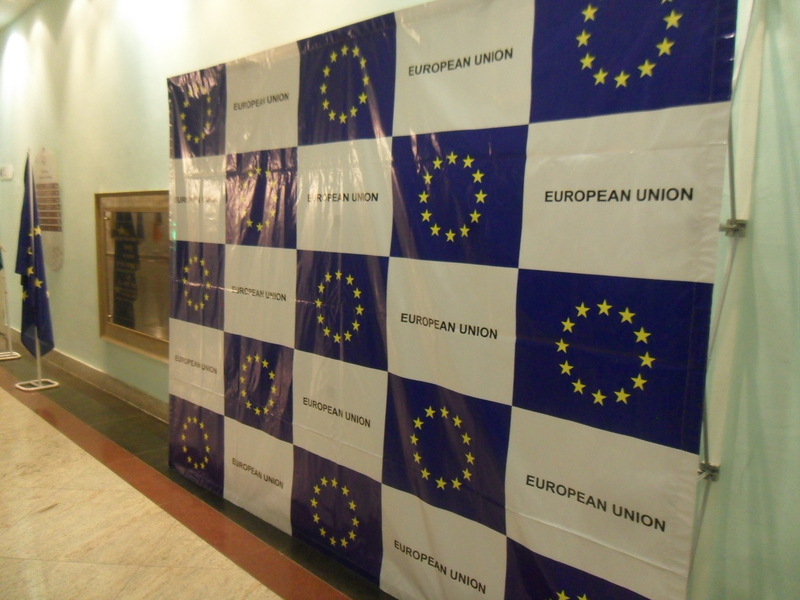 The program was organised by the EUROPEAN UNION to celebrate the 10th anniversary of ‘NEEMARANA MUSICAL FOUNDATION’. 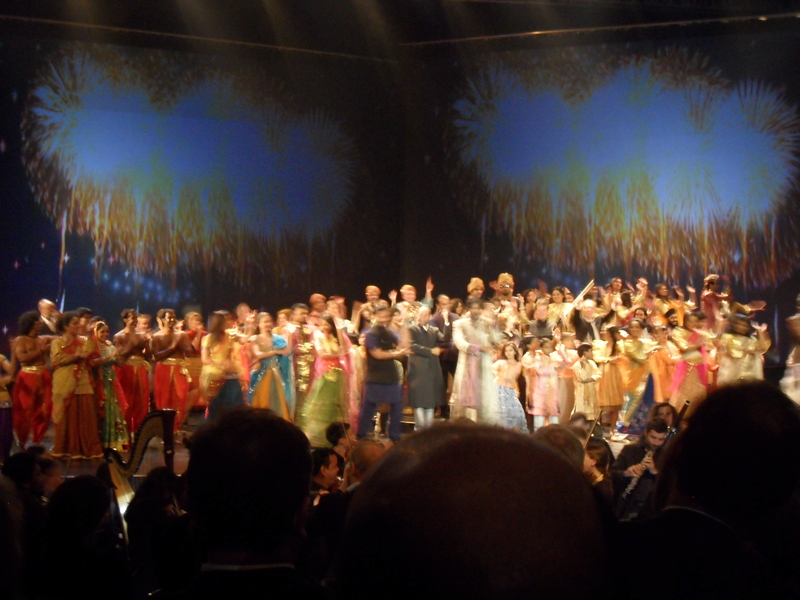 It was a fabulous program and it was the first time I had seen an opera, so I enjoyed it a lot. 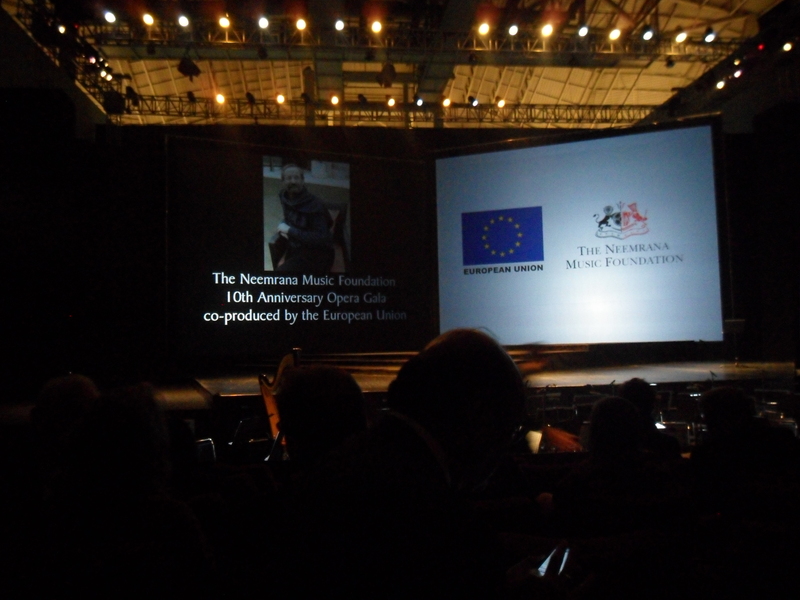 The NEEMARANA MUSICAL FOUNDATION was established by Mr. Francis Wacziarg. Neemarana Musical Foundation is supporting to the Blind relief association school and the under privileged children of Khushii NGO. We had a lovely evening and enjoyed ‘OPERA GALA’. 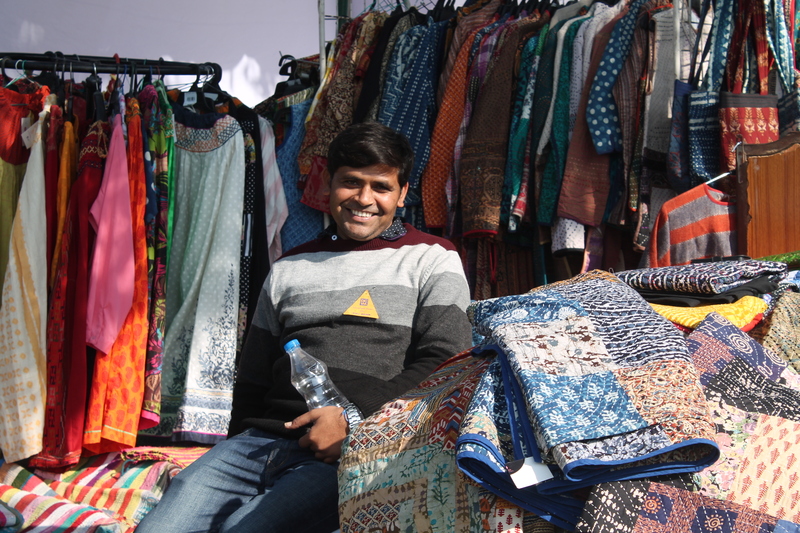 On Sunday, 7th of December 2014, we visited an International Bazar at the Ashok Hotel in Delhi which was organised by DCWA. 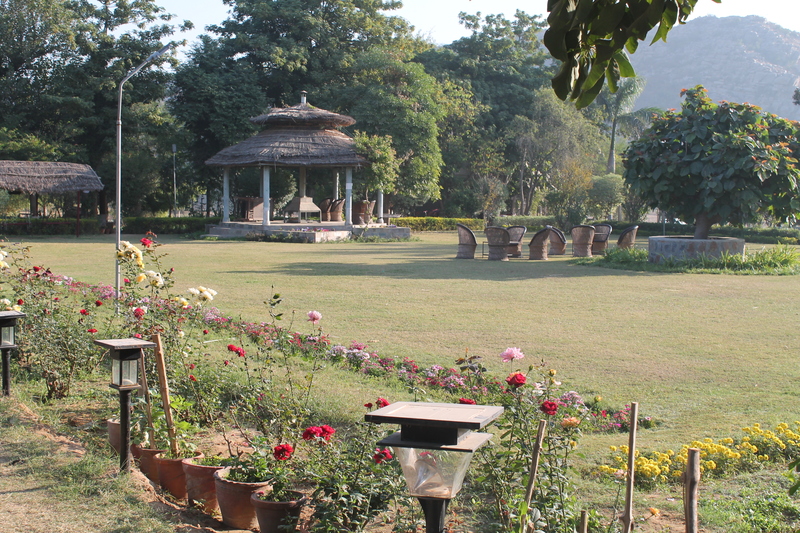 DCWA (Delhi Commonwealth Women’s Association) was originally founded in 1952 to provide an opportunity for cultural exchange between women of the commonwealth, and helps the poor and needy of Delhi and surrounding areas. 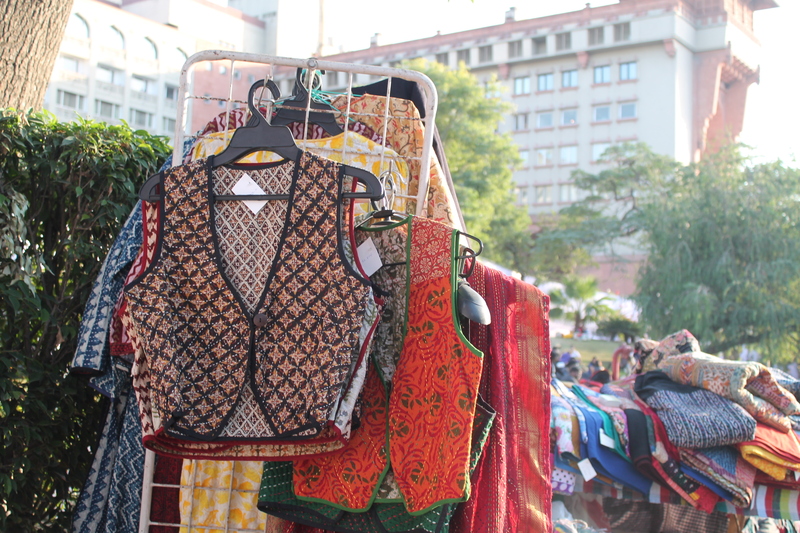 As you know the Laksh Foundation has a women’s cooperative which supports the rural women. 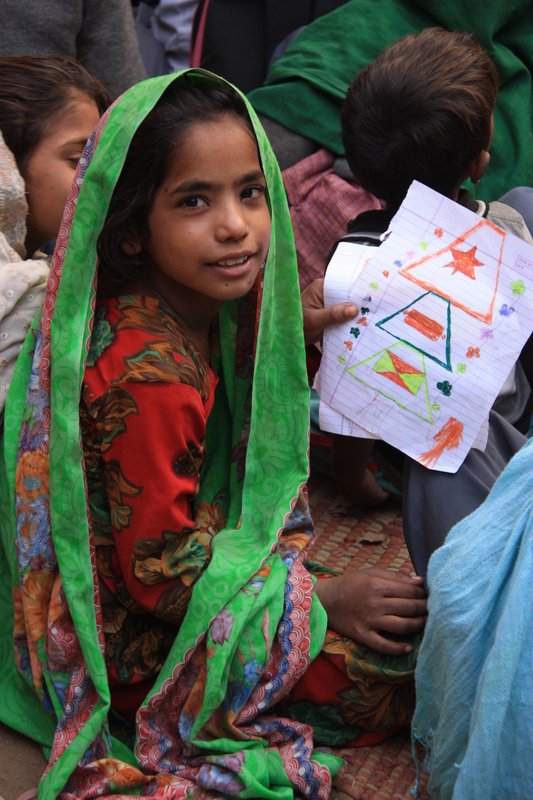 Lots of women come to the foundation and stitch clothes. 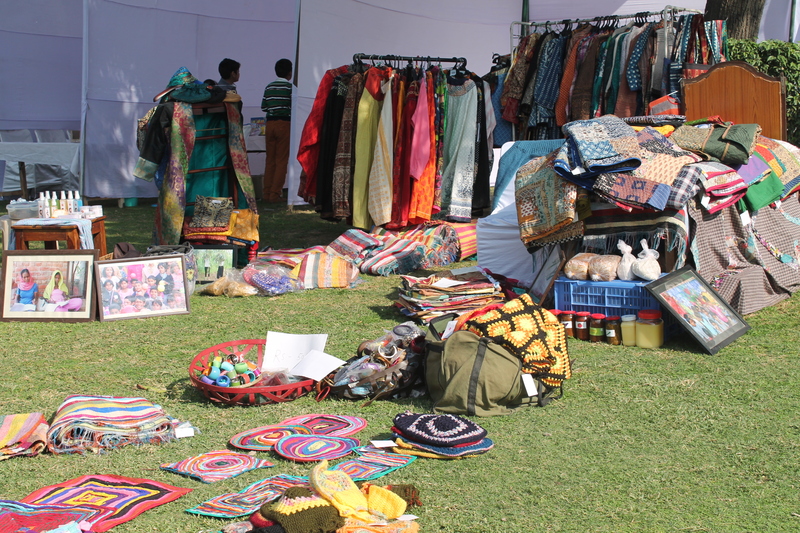 The Laksh Foundation was given a free stall at the DCWA mela to promote the women’s cooperative. It was a great opportunity to promote our project and we had a nice experience.